Yonhap News Agency quoted a spokesman for the South Korean president, Kim Eui-kyeom, as saying his government will spare no effort for a successful outcome of the summit by closely cooperating with the US and holding more talks with North Korea. The White House announced that Trump and Kim will meet at the end of February to try to broker a deal to coax the North to give up its nuclear weapons. News of a second summit came after Trump’s 90-minute meeting with North Korean envoy Kim Yong Chol at the Oval Office. President Donald Trump is to hold a second summit with the leader of North Korea near the end of February to try to coax the North to give up its nuclear programme. White House press secretary Sarah Sanders said Trump met for 90 minutes with Kim Yong Chol to discuss denuclearisation and a second summit. She said the president looks forward to meeting with North Korean leader Kim Jong Un at a place to be announced at a later date. Trump had his first, historic meeting with Kim Jong Un last June in Singapore and reached a vague denuclearisation agreement, but little tangible progress has been made since. So far, no details have been publicly released about how denuclearisation could occur. UN Secretary-General Antonio Guterres says “it’s high time” for serious negotiations between the United States and North Korea to outline a roadmap for the denuclearisation of the Korean peninsula. Guterres spoke as North Korean envoy Kim Yong Chol met in Washington with President Donald Trump and Secretary of State Mike Pompeo to discuss a second summit between the US leader and North Korean leader Kim Jong Un which is expected to focus on ending the North’s nuclear weapons programme. President Donald Trump is meeting shortly with a North Korean envoy in the Oval Office to discuss efforts to get North Korea to give up its nuclear programme. 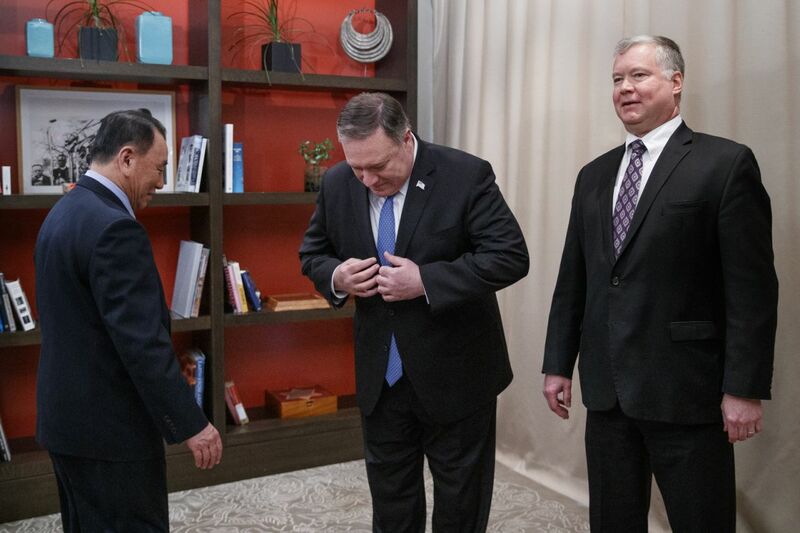 The former North Korea former spy chief met earlier with Secretary of State Mike Pompeo (pahm-PAY’-oh) at a Washington hotel. Trump has spoken several times of prospects for a second summit with North Korean leader Kim Jong Un (kim jawng oon) early this year. He’s also exchanged several letters with Kim despite little tangible progress on a vague denuclearisation agreement reached at their historic first meeting last June in Singapore. 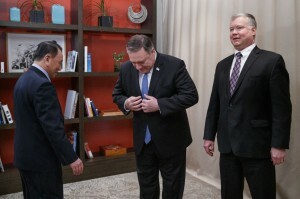 Secretary of State Mike Pompeo (pahm-PAY’-oh) and North Korea’s former spy chief have begun their highly anticipated meeting aimed at resuming efforts to end the North’s nuclear weapons programme. Pompeo and Kim Yong Chol are meeting at a Washington hotel but they’re not responding to reporters’ questions heading into the talks. Trump has spoken several times of having a second summit early this year, And he’s exchanged multiple letters with Kim despite little tangible progress on a vague denuclearisation agreement reached at their historic first meeting last June in Singapore. President Donald Trump has spoken several times of having a second summit with North Korean leader Kim Jong Un early this year. And Trump has exchanged multiple letters with Kim despite little tangible progress on a vague denuclearisation agreement reached at their first meeting last June in Singapore. Talks in Washington between Secretary of State Mike Pompeo are former North Korean spy chief Kim Yong Chol are aimed at finalising a second summit.